This verses aptly sums up the past month for us as we have been privileged to speak at 4 different family camp weeks. Though it should go without saying that the deepest desire of our hearts would be fulfilled by a reinstatement of our lifelong ministry at Campus by the Sea, we are so very grateful that our passion for encouraging and strengthening families through family camp found expression again this summer in four wonderful weeks of camp. 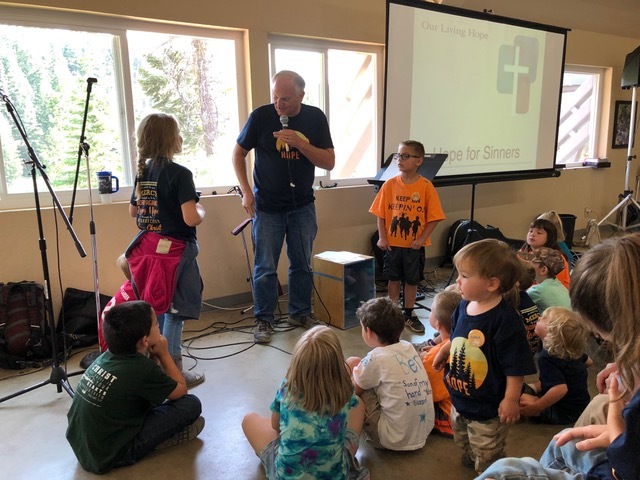 Honored to be invited back as speakers for Calvary Chapel of Chico’s second annual Family Camp, we delighted to once again be with this vibrant group of Christ followers. It’s a long story, or at least it was a very long drive from Sacramento to Pilot Lake that dark night of Sunday, July 15. After meeting up with friends for an early dinner close to the airport (having arrived at 3 pm), we followed our GPS which is usually dependable, but which epically failed us that night. Admittedly we were both suspicious when it directed us 100 miles east to Truckee before heading north to work our way through the Sierra Nevadas to the hidden gem called Pilot Lake, but follow it we did. What should’ve been a 2 hr 15 mins trip from the airport to the camp turned in to a 5-hour trip, fraught with frustration, fear, and fuming. We finally arrived after 10 pm, having missed dinner and the evening meeting with the planning team, but . . . we made it. And it was worth it. 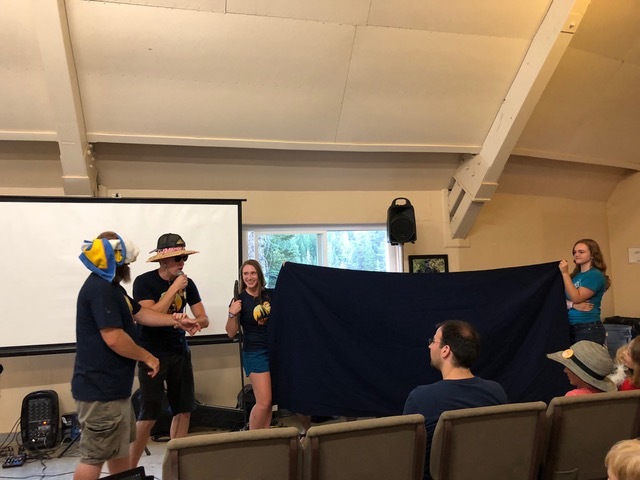 Led by Cameron and Andrea Kovacs (long time CBS campers; she grew up at camp, they have raised their family at camp, and several of their six children have served on staff), they used the CBS family camp prototype for this camp and pulled it off beautifully. 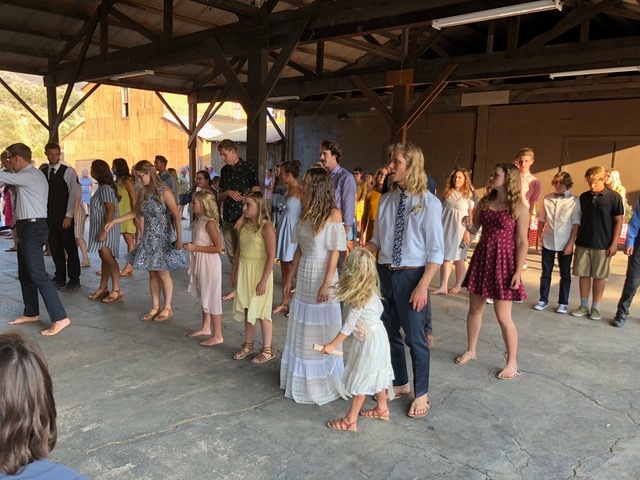 Two of their sons, Robert and Jacob, along with Jacob’s fiancée, Whitney, led worship and carried on the beloved tradition of writing a fabulous memory verse song. They knocked it out of the park. They were joined by several other former CBS program staffers which made the week special in so many ways. Our teaching times were well received and many shared with us that God met them in very specific ways at camp. What a joy to be part of His kingdom work!! The former CBS program staff who helped staff Calvary Chapel of Chico’s family camp at Pilot Lake. Robert and Jacob Kovacs and Whitney (Jacob’s fiancée) teach the memory verse song at family camp. Paul leads the morning devotions for a very engaged group of young (and old) ones. 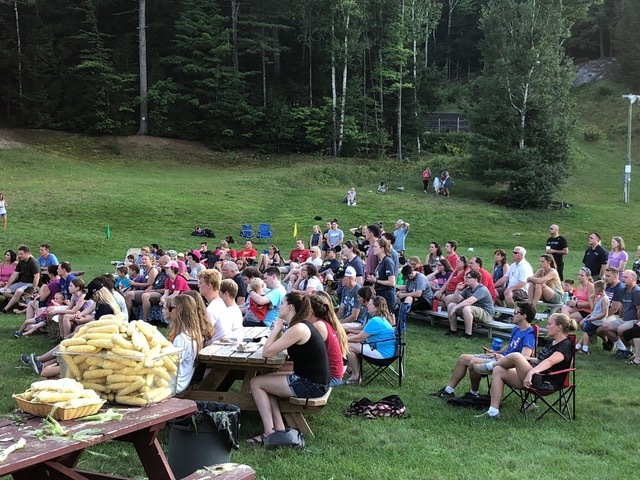 Lots of fun and fellowship filled in the gaps, including great waterfront activities (like the Flying Fox, which was super cool), s’mores and worship around the campfire, a great anniversary skit done by our CBS crew, baptisms, hikes, and yummy meals. 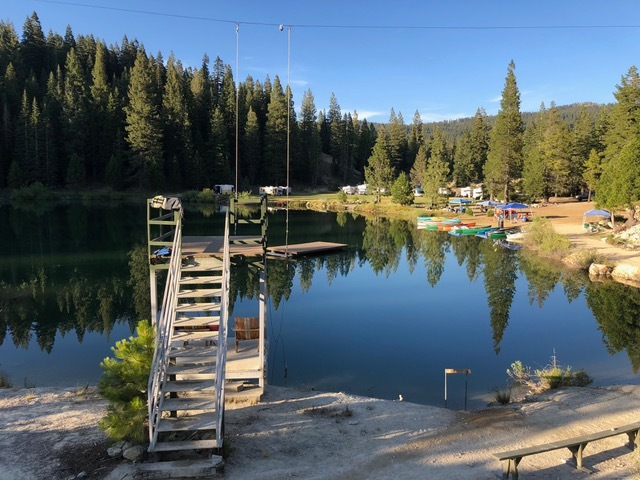 Because Pilot Lake is “off the grid,” it was also a relatively distraction-free zone, which is the best setting in which families can reconnect. Pilot Lake was not tranquil like this from 2 to 5 every afternoon, as campers enjoyed fun activities on this beautiful lake. Robert and crew pull off a great anniversary skit for Jude and Andy's 25th anniversary. It was all you could hope for in a community-based and intergenerational, community-building family camp. Our much shorter trip back to the Sacramento airport was welcomed and off to San Diego we flew to spend a week with my mom. How we cherish these days with her!! With Paul behind the “wheels” of her wheelchair, we went to the Farmers' Market, Balboa Park, the “Greatest Generation Ever” walk, and of course, to Costco. 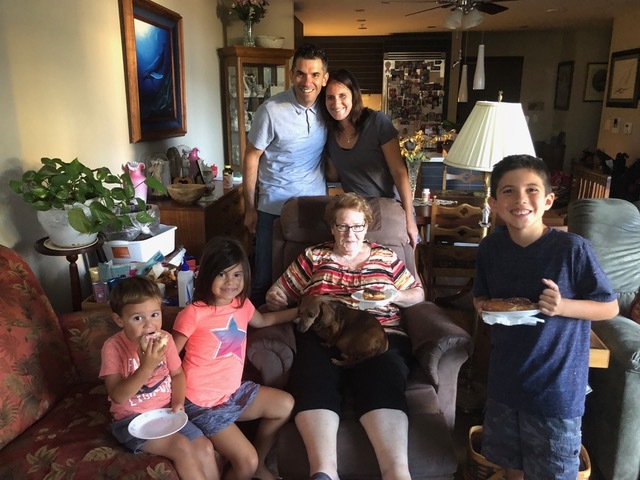 We talked a lot, watched her two favorite shows (“Wheel of Fortune” and “Jeopardy”) nightly, got our toes done (excluding Paul), gave foot rubs, had some great in-house meals, and made memories. 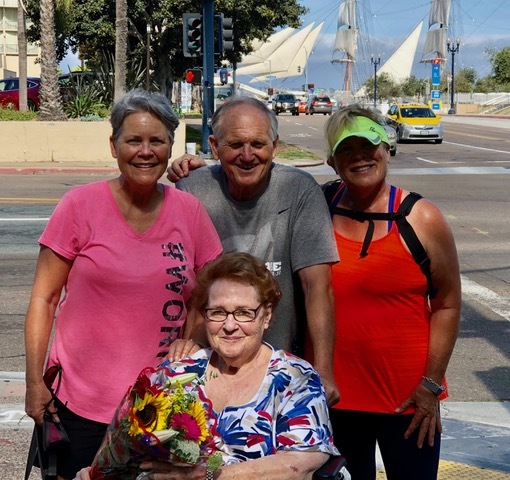 My sister Melissa joined us as we “rolled” Mom through the Saturday Farmers' Market in downtown San Diego. 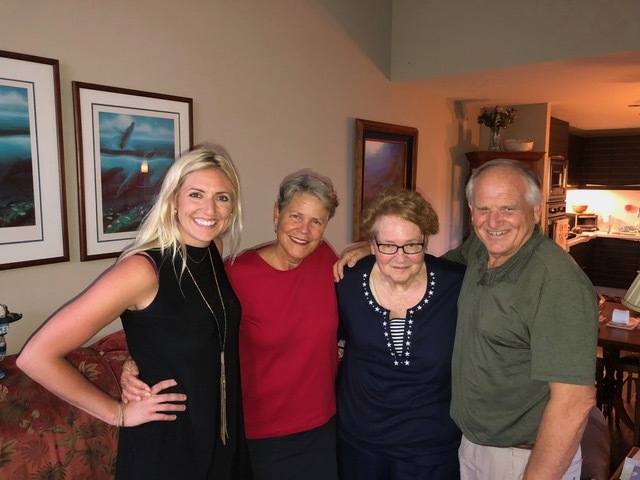 We were also there to welcome all three of our daughters, who made it down during that week to visit their Grammie with their families. Gabe and Kari and their three spent Sunday the 22nd with us, and Derek and Julie and their two plus Lisa came in at the end of the week. What day-brighteners those Littles are!! The noise and action they bring to Grammie’s normally tranquil home is a mostly welcomed change of pace. The Garcias arrived bearing doughnuts for their Great-Grandma Essie. 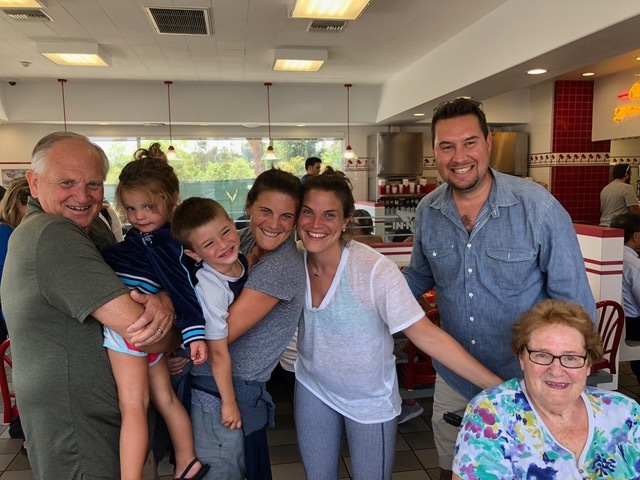 Later that week, Derek and Julie, with Nathan and Rachel, arrived to visit; first stop, “In and Out” Burger. Of course. We were so happy to be in San Diego for the wedding of Brandon and Emma (Kelly) Zeek on the 21st. Both CBS’ers, Brandon had declared to us six years ago that someday he would marry Emma, who was then starting her freshman year of college. And he did . . . six years later, with undergrad and graduate studies done for her. It was a beautiful celebration of “all that is good,” culminating with Brandon reading from their shared journal his commitment to loving Emma well, which he had penned just days before. It reflected so much depth of heart and character and was truly a joy to witness. 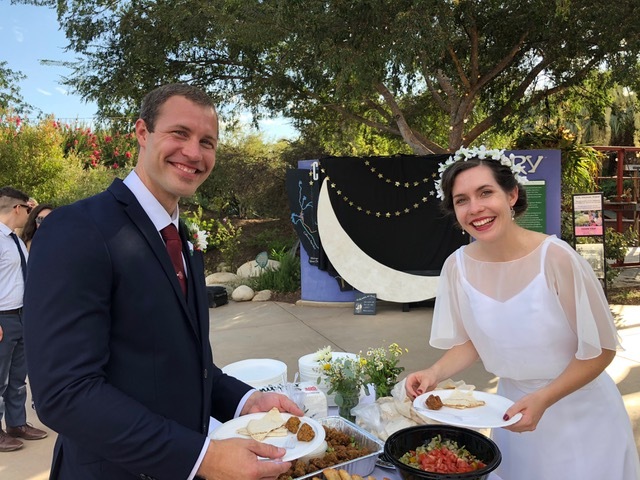 Brandon and Emma (Kelly) Zeek celebrating their wedding at the outdoor reception. We left my mom’s the following Friday (July 27th) to head north for the marriage of Seth and Dorothy (MacDonald) Heinz. These two back-to-back weddings couldn’t have been more different in form: the Zeeks were married in a formal Anglican service (with a beautiful outdoor reception) and the Heinz’s were married at Paramount Ranch in the beautiful outdoors surrounding by an old western town built as a movie set. But thankfully they were in sync in substance: both Christ-centered celebrations uniting two very honorable couples. We had a blast at Seth and Dorothy’s wedding, at which Paul had the honor of officiating. Seth’s family has been coming to CBS family camp since before Seth was born (with his two slightly older sisters, Marina and Lauren) so we’ve known him his whole life and watched him grow from a tow-headed young soccer player into a phenomenal CBS program staff member for three summers during his college years. He and Dorothy, who were in kindergarten together, started dating at the end of their junior year of high school . . . and six years later, tied the knot. Crazy that both of these couples had such long courtships, during which they were committed to honoring God in all their interactions. How hope-giving!! One of the highlights of their wedding was having over 20 CBS program staff gather for the long-awaited day. 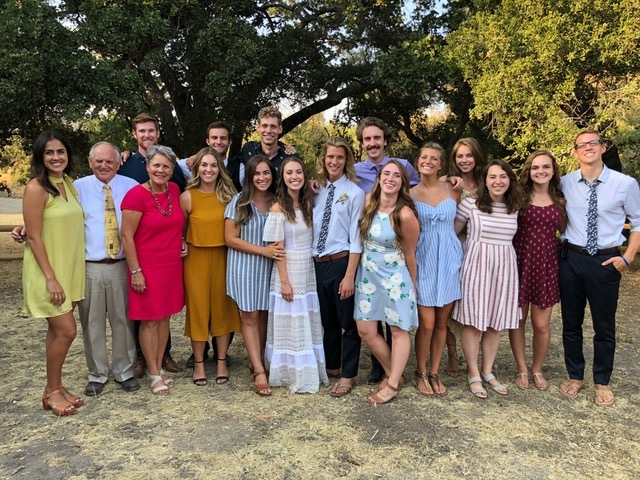 Their bond is deep after having lived together in the seven-week summer community at CBS, off the grid, centered around the Lordship of Christ and servanthood, and intentionally discipled. Many of them had spent several summers together and they have each others’ backs as well as their hearts. Long after their last summer together (two summers now), they are still holding one another accountable and “spurring one another on to love and good deeds.” It truly gladdens our hearts to have them in our lives. Seth and Dorothy Heinz are pronounced Husband and Wife by my favorite officiant. Some of the former CBS staff who attended Seth and Dorothy’s wedding celebrated the marriage and the reunion. Another highlight of the Heinz wedding was having Robert Kovacs (Seth’s best man) teach the “Rain Dance” to all. Such fun to cut it loose on the dirt floor to a dance connected to so many great memories of summers gone by. It was a joy-filled, God-honoring day of celebration that we were thrilled to be a part of. Robert teaching the “Rain Dance” to the wedding guests. It was so much fun. 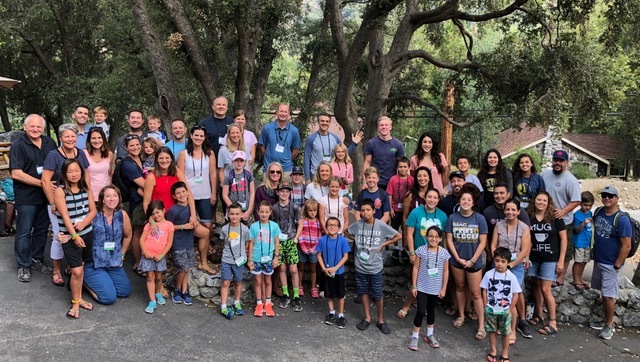 Forest Home Family Camp began the next day (Sunday, July 29) and were we ever surprised to find, while registering our grandkids for class, there were 15 former CBS families that had made their way to Forest Home!! 52 campers in all, deliriously happy to be with one another and with us. Many others had written us that they wanted to come but couldn’t, either because of expense or schedule, but prior to that Sunday, we only knew of two families who were going to be there. We were blown away!! What a tearful, happy surprise reunion as we reconnected with these beloved friends. In the mix were our own daughters and their families. Forest Home generously invited them to join us at camp and we were housed together in a beautiful, three-floor cabin which easily accommodated all of us. That was the icing on the cake for us. It was gift enough to be speaking at this historic family camp, but to have our own family reunion in the midst of it was extravagant. Though very different from family camp as we know it, we loved our time there. The campers were warm and oh so receptive and appreciative. The program was well run and our Littles had a blast. We experienced lots of fun adventures throughout the week . . . like zip lining, the giant slide into the lake, kayaking, hiking to the traditional pancake breakfast at Inspiration Point, making take-home-worthy craft items at the Craft Store, and swimming in their beautiful new pool. Late night chats around personal fire pits and Child Care Assistants for the Littles (and yes, those two are related…while the CCA’s were with the kids, the parents were chatting around the fire!) provided couple time on top of all the family time. Delicious meals satisfied hungry tummies, setting the stage for hungry souls to be fed by wonderful worship (lead by Mandie Pinto—look her up!) and teaching. Another highlight of the week was Nathanael Pierce’s request that Paul baptize him. 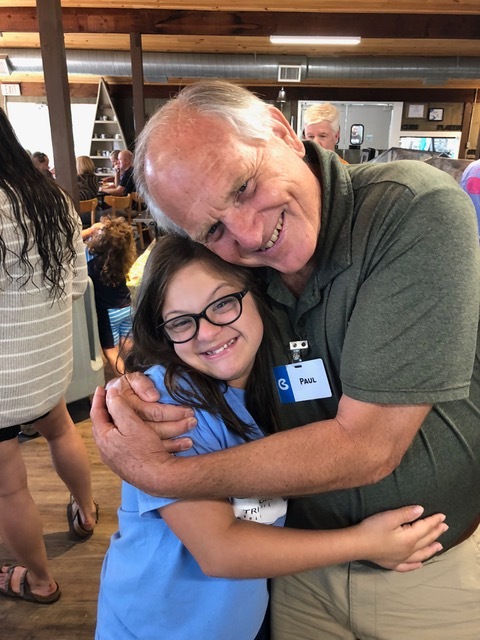 Another CBS “kid,” Nat was serving as staff for Forest Home and it was such an unexpected honor for Paul to celebrate this milestone moment in Nat’s life. 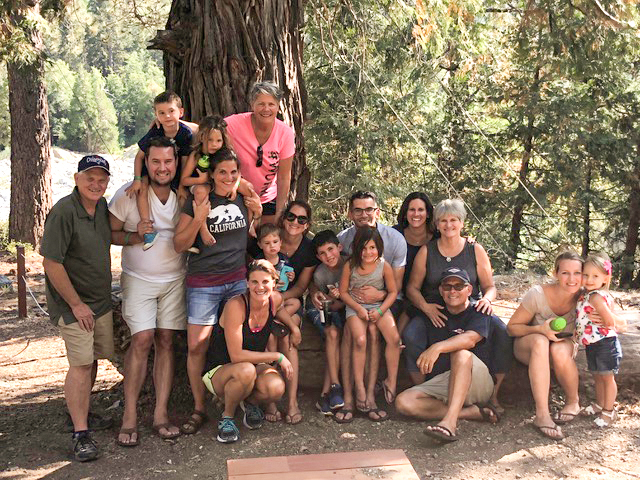 This group of 15 families were delighted to be at family camp together . . . different venue, same heart. 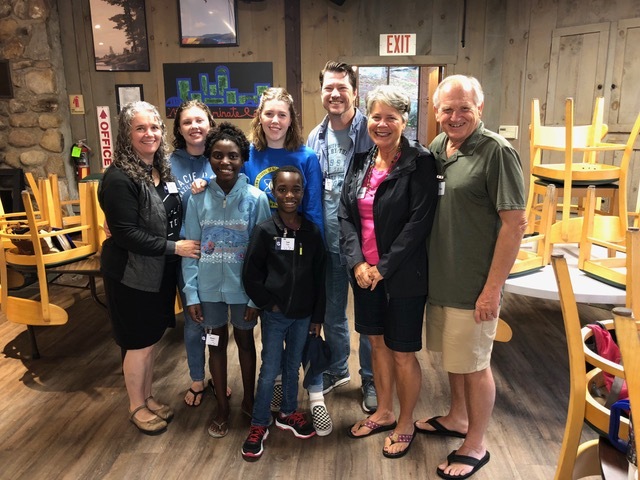 Paul’s sister Carol and brother-in-law Wayne, daughter Katie, daughter-in-law Angie, and granddaughter Emma spent an afternoon with us at Forest Home. Loved every minute with them! “Lake Day” at Forest Home . . . so many fun things to do as families! Paul baptizes Nat Pierce . . . a very meaningful moment. 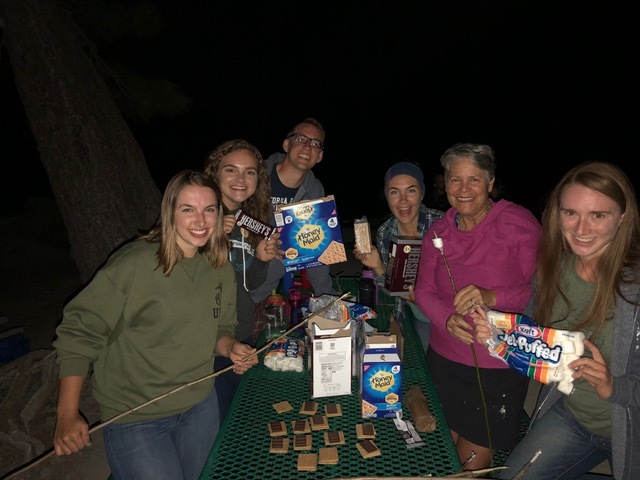 It’s not camping if you don’t have s’mores around the campfire at least once!! Childless, around the private campfire pit . . . a very sweet feature of Forest Home's family camp. The week was refreshing, renewing, and amazingly relaxing. Down the mountain we drove Saturday, August 5, stopping at a coffee shop in Redlands to meet up with more CBS friends, Ken and Kim Johnson, and then on to the Garcias for swimming and dinner as our last family reunion hurrah before heading to the airport for a red-eye to New England. Thankfully all went like clockwork and after getting ferried home by our dear friend Patty Benes, we did some laundry, repacked, and and several hours later drove to Newfound Lake for the next two weeks of family camp at Berea. On our way to Berea, we were able to stop by the rehab hospital and spend some time with Tommy and Nancy Devlin. Tommy is a Massachusetts State Trooper who was hit by a car while writing a ticket on Route 3. It’s a miracle that he’s even alive, thankfully, but he has a long road of recovery ahead of him. Long time family campers and very dear friends, we were so grateful to see them before we went to camp. 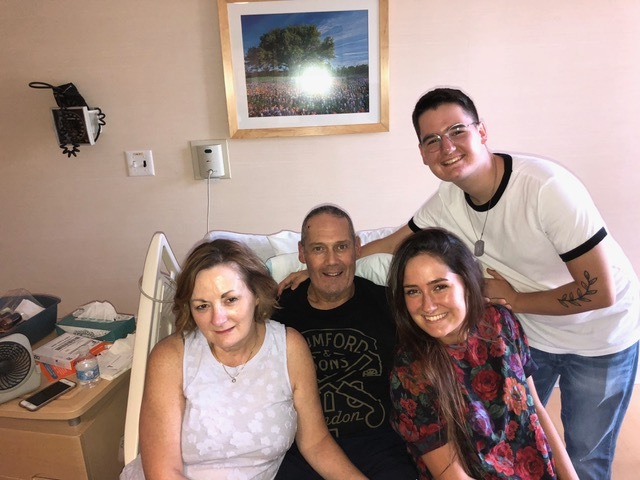 Tommy and Nancy Devlin and two of their four kids, Rachel and Paul, are working together as a family to help Tommy fully recover. We began directing Berea family camp in 2006, and after 11 summers of running it by picking up the CBS program and staff at the end of seven weeks at CBS and dropping it at Berea for two weeks, we “passed the mantle” to Nate Parks and his team at Berea. The transition happened over two years and though we really didn’t want to stop running it, the expense financially and physically had become too much so we confidently turned it over to them to run. This was our first time back after two summers of not being there and it was like stepping into a huge family reunion. 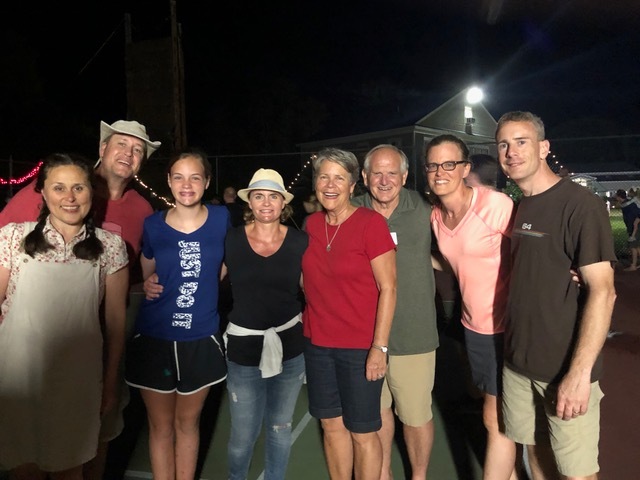 So many families who had spent years with us at Berea (and prior to that at Geneva Point Conference Center where we originally launched family camp while on staff at Grace Chapel) were gathered. A foretaste of Heaven for sure. It’s very different to just speak at a camp we had been entirely responsible for programmatically for so many years!! A lot more relaxing, for one, and a lot more “freed up” time, which allowed us to hang out with everyone in between sessions. We even made it to the waterfront and went swimming!! There was an audible gasp from the family campers who watched Paul swim for the first time at Berea during camp. 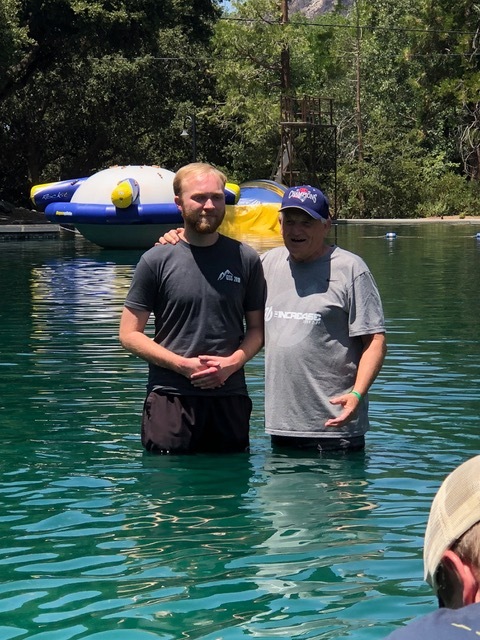 He had previously only gotten wet in the lake doing baptisms!! I’m pretty sure some were wondering if he could swim!! He can and he did. Although there were many highlights during the weeks, one of the best from both weeks was the college group. Until 6 years ago, we didn’t have a college group at the New Hampshire family camps, because all the families had younger children. It was so exciting to us to have a college group of 6 six years ago . 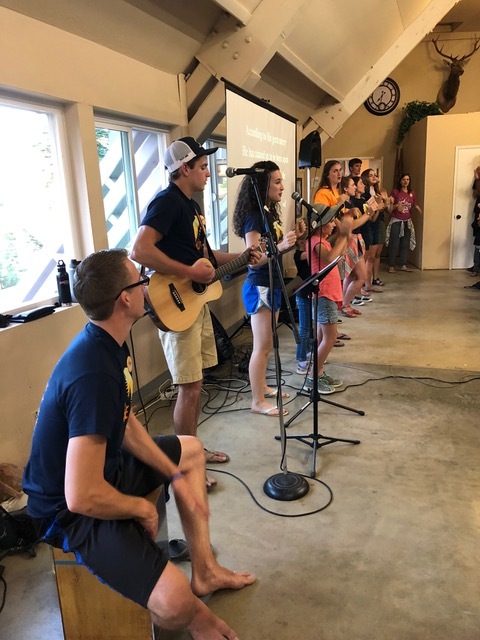 . . and this year, family camp week one had 19 college students and week two had 10. We were SO encouraged to see these young men and women committed to continuing their family camp experience—but more than that, committed to following Jesus. All praise is His!! 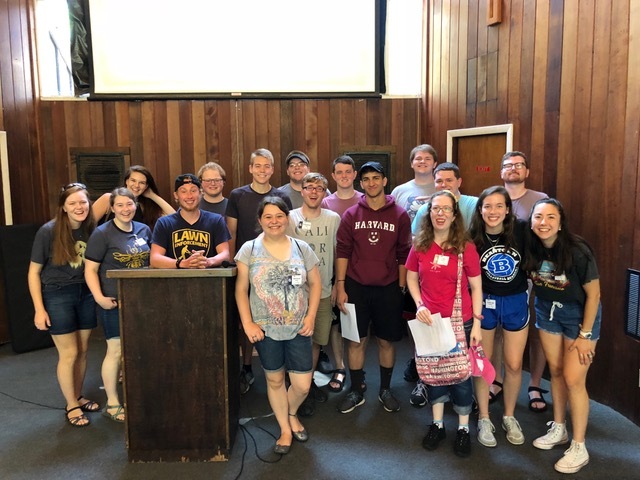 Most of the college group at family camp 1. The Yardley family came up from North Carolina to continue their commitment to the tradition of family camp. Outdoor worship, family games, and shucking the corn for the Corn Roast . . . mixing new and old traditions! 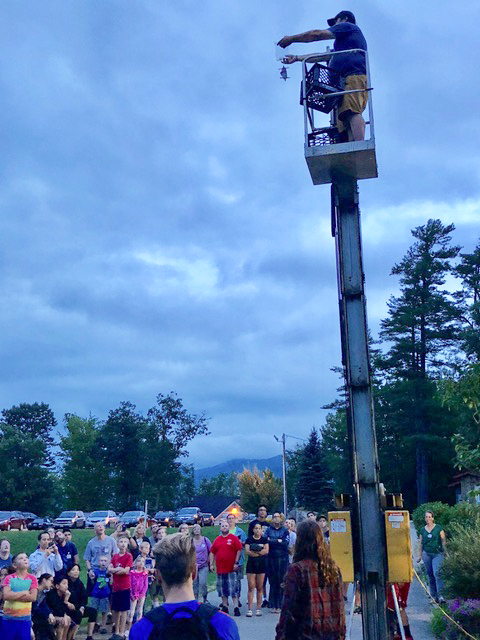 Another creative activity for families was the egg drop contest. The square dance was held on the tennis courts and was MUCH cooler than in the gym. Great new change!! Paul fulfilled Joy Potter’s desire to be baptized at camp at a private beach on the lake. Meredith Grieci and Paul have always had a special bond. We were so thankful they drove all the way from Raleigh, NC, to get this hug! 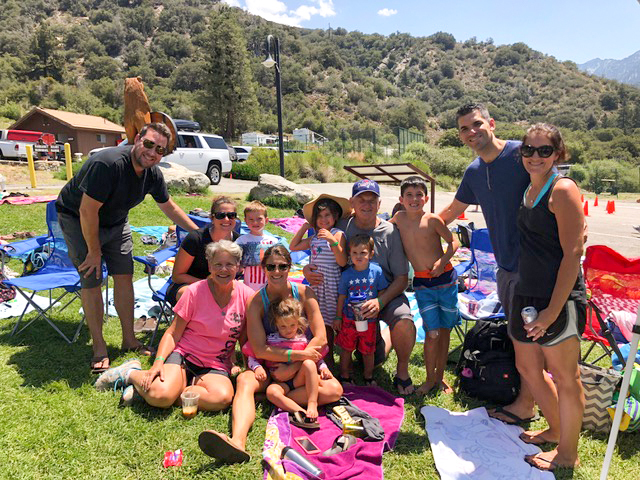 A highlight during the second camp was having a CBS family from Orange County, California, make the trek to New Hampshire for camp on a lake. 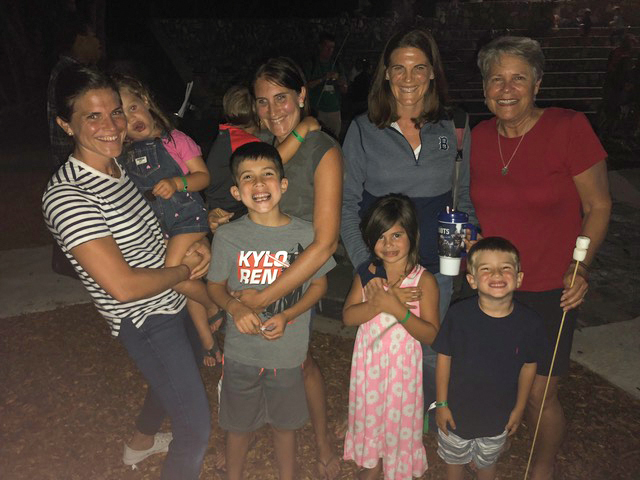 :) Scott and Jill Dunn and their four surprised us when they showed up and we had so much fun all week helping them adjust to and experience this very different, but very same family camp experience. 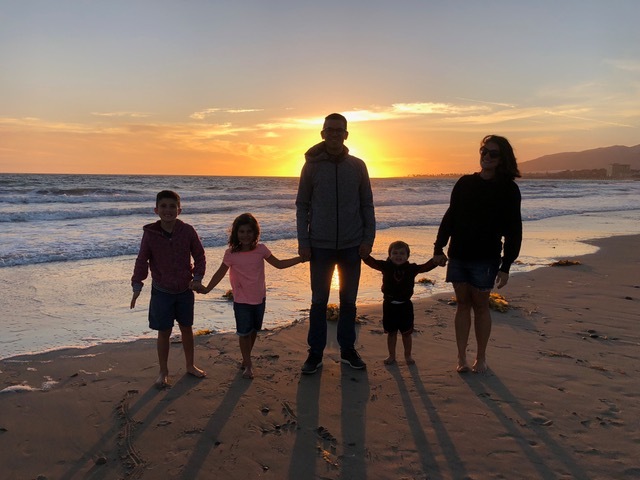 After a rough start (missed flight out of LA, late arrival to camp, and two days of rain to kick off camp), things dramatically improved and they ended up having a great time. We loved having them stay with us for a night after camp ended and showing them a few of the local sites. Many great memories were made with them. 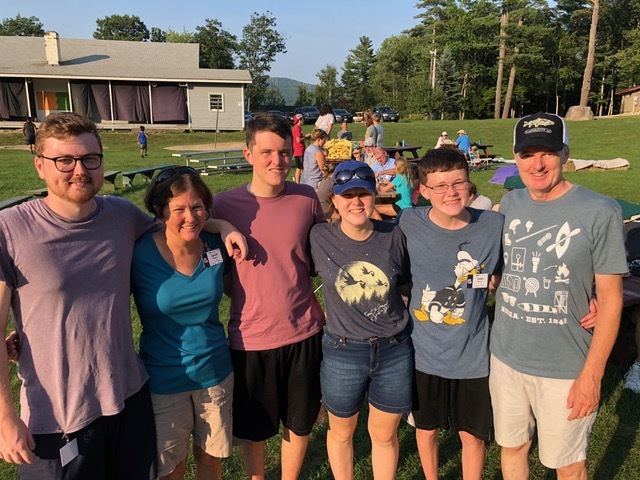 Scott, Jill, Katie, Ally, Mary and Ian Dunn made their way to family camp in New Hampshire. A little over 24 hours after they left, on Monday, Aug. 20, I flew to San Diego to spend 9 days with my mom. The twofold purpose was to enjoy time with her, as well as prepare her small condo to welcome a 28-year-old “companion.” She’s still very capable, mobile enough, sharp minded, etc., but we all felt it would be better for her to have more of a presence with her at home, so “Naomi” moved in this past Sunday (the 26th). We all believe God orchestrated this arrangement and think it will be mutually beneficial. She needed a place to live and my mom needed someone to live with her. I was still in San Diego for her first two days and all indications are that this is a good set-up. We’re all so thankful. Naomi moved in with my mom on Sunday in what we trust is a mutually beneficial arrangement. Paul surprised me by showing up at my mom’s on Sunday the 26th . . . and what a nice surprise that was. 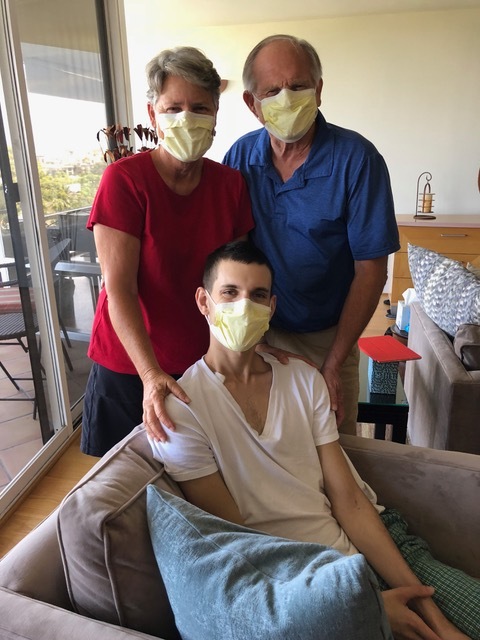 He was a huge help in getting the last few things done for my mom, and with traveling north to visit my nephew Alex, who is undergoing chemotherapy at UCLA Santa Monica’s medical center for recently diagnosed osteosarcoma. Please add Alex to your prayer list. The next nine months will be very difficult for him. So thankful for a brief visit with our nephew Alex who is undergoing chemo to treat osteosarcoma. 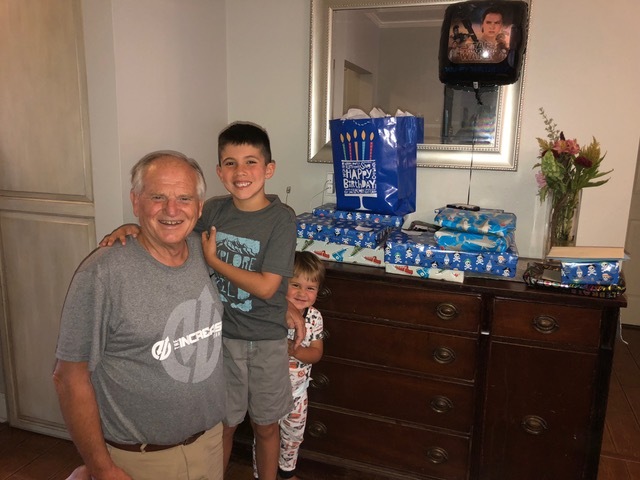 In honor of Paul and our grandson’s shared birthdate (August 29), we also managed to squeeze in a short visit with the Garcias and Lisa prior to boarding a plane from Los Angeles to Boston today. Lots of fun was had celebrating these two great guys, making it all the harder to say good-bye this morning. One of the great benefits of Heaven: no more farewells. Early birthday celebration, watching the sunrise in Ventura. That’s a wrap on this blog, and a wrap on the summer. That was fast!! We’ll take the next few days to reflect on the many ways God met us during a summer, which once again tapped in to places of deep pain. How very thankful we are that God is so faithful and good, that He meets us with such tender loving care and reminds us of His sovereignty and His presence . . . in different venues, but with the same heart.